We hope renewing (and new) members will take this very short survey. The Board is hoping to better understand how we can help make your cycling experience better. Don't hesitate to offer comments or suggestions! Getting Ready for the Spring Season? 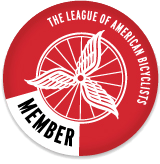 As a member of the League of American Bicyclists the Club receives very favorable insurance... ...but the League is also a wonderful resource for all things cycling! Visit their site!